Announced in late 2017, the Corsa Control is the latest addition to Vittoria’s Corsa flagship road tires lineup. It’s essentially a tougher version of the very popular Corsa. Here’s what Vittoria’s Marketing Executive, Cristian Bellini has to say about the Corsa Control​. Okay, let’s break that down. Here are the main features of the Vittoria Corsa Control G+ tires. Tougher than the Corsa G+. Vittoria beefed up the Corsa Control as it's meant for riding on rough roads. Ideal for Slippery Conditions. They provide a better grip with a new thread pattern on the shoulder edges. 4C Compounds. Vittoria uses 4 different compounds to develop a tire that has an ideal balance between speed, suppleness, durability and reliability. Available in 2 Versions. Available in clincher and tubular. Tubeless is not available. Tool-free Mounting. With its supple casing, it’s easy to sit the tire bead into the rims. You probably don’t need the tire levers too. Very Grippy. The chevron style patterns on the shoulder edges help improve grip significantly especially in the wet. Wears Out Fast. 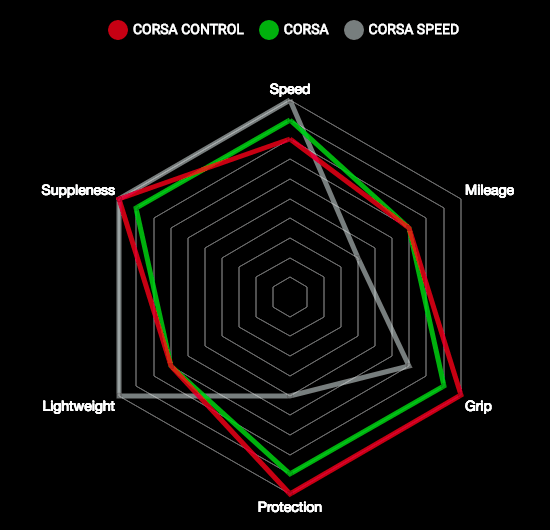 Compared to other similar tires, the Corsa Control has a much faster wear rate. The Corsa Control is the successor to the Pave. The major difference between them is in the tire compound. Vittoria uses a new compound in the Corsa Control and calls it the 4C. 4C is a layering process exclusive to Vittoria where 4 separate compounds are used in a single tire tread. Most of the tires today only uses 2 compounds at best. Vittoria claims that their tires are now intelligent with the ITS. “Intelligent Tire System (ITS) compounds become harder and softer, depending on the needs of the rider. The Corsa Control is simply a tougher version of the Corsa. 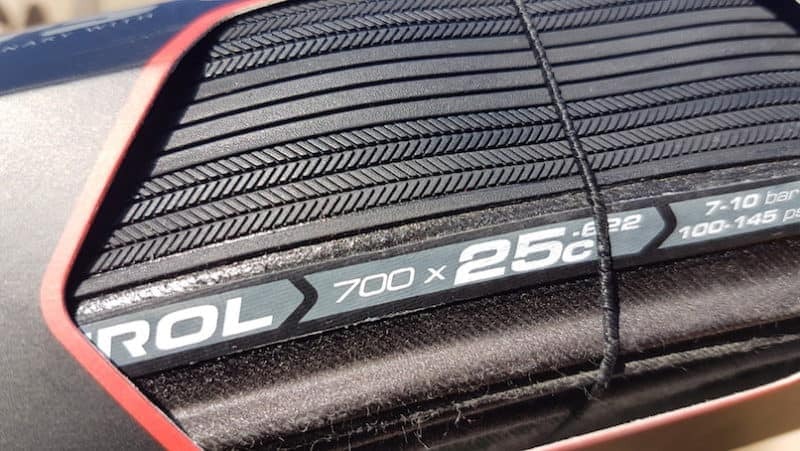 The Corsa Control uses the same 320 TPI (threads per inch) Corespun-K casing as the Corsa. A higher TPI count results in a suppler tire, lower rolling resistance and hence faster. For a wet weather tire to have 320 TPI, that’s a big deal. To put things into context, wet weather tires generally have between 60 to 120 TPI. At 320 TPI, the Corsa Control is in a league of its own. To achieve this, Vittoria made 2 subtle but significant changes over the Corsa. The chevron patterns increase the interlocking between the tire and the road surface during cornering. Upon contact, they hook up with the road surface irregularities, and the better the hook up is, the more grip it provides. Vittoria added a bit more rubber to the Corsa Control. The Corsa Control is designed for added puncture protection. It measures 0.4mm thicker around the central layer and has a breaker belt just beneath the threads. The added rubber means that the Corsa Control is heavier and feels firmer than the Corsa. Hence, you can expect it to be slightly harsher. You can easily minimise this by running a slightly lower air pressure. Throughout this Melbourne autumn/winter, I’ve racked up around 1000mi/3200km of riding and I’ve not experienced a single puncture. The Corsa Control comes in both clincher and tubular version. They are available in black and para (tan) sidewall options. You’re out of luck if you’re looking for a 23mm version. You want a fast tire, yet with a high level of puncture protection. The Corsa Control is the ideal tire that you can use ALL YEAR round. It offers more grip, durability and protection over the Corsa with only a slight increase in rolling resistance. 1. What are the other models in Vittoria's Corsa lineup? Besides the Corsa Control, there are 2 other models. Corsa. Sometimes referred as the regular Corsa, this tire is meant for dry conditions. They are ideal for summer riding. Corsa Speed. The fastest among all the Corsas. Save these for time trials or criterium racing. They wear out real quick! 2. What is an Open Tubular? It’s actually a type of clincher tire that is constructed the same way as a tubular tire. They have the same properties with the difference being that both ends of the tire is not sewn together and hence the ‘open’. 3. How much mileage can I expect from the Corsa Control? Realistically, you’re looking at around 2500mi/4000km. Having said that, it also depends on the road surface that you ride on. One of the well-know tip to squeeze more mileage out of the tires is to swap the front and back every 1000mi/1600km. 4. Does the Vittoria Corsa Control G+ available in tubeless version? The Vittoria Corsa Control doesn’t support tubeless. The only tubeless ready tire in the Corsa range is the Corsa Speed.